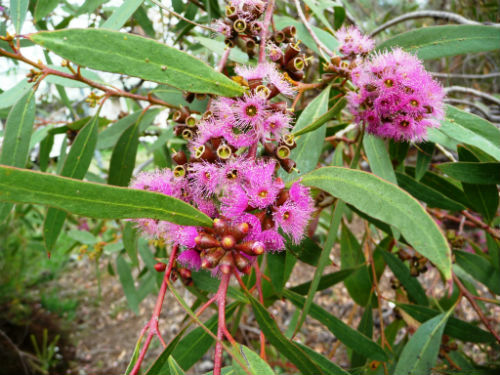 Eucalyptus lansdowneana, Crimson Mallee is a small tree that will reach a height of six metres. In the wild plants usually have multiple stems (mallee growth habit) but in cultivation plants usually restrict themselves to a single trunk. Bark is persistent on the lower stems, otherwise smooth and shed in long strips. Leaves are 15 centimetres long, two centimetres wide, leathery, lanceolate and yellowish-green to grey-green. Buds, flowers and fruits are held in groups of seven. Flowers are an eye-catching dark pink to crimson-red. They make an appearance from autumn to spring. Fruits are cylindrical to somewhat urn-shaped and slightly ribbed or angled. E. lansdowneana is a beautiful small tree that is very hardy and could be grown as a “stand alone” specimen plant or incorporated in a native shrubbery. The Crimson Mallee is small enough to be cultivated in suburban gardens. Crimson Mallee is endemic to South Australia where it is found in the Gawler Range, north-west of Adelaide. E. lansdowneana is classified as rare because of its limited distribution but is widely cultivated in South Australia. The type specimen was collected on Pandura Station, South Australia and named in 1889. The species name commemorates Thomas Lansdowne Browne who owned Pandura Station and collected the type specimen.